Attachment styles provide a useful framework for developing insight into the quality of our close relationships, particularly our parent-child and romantic ways of bonding. This behavioural system affects our general wellbeing throughout our lives. The way we think, feel and behave in close or romantic relationships are representative of our attachment style. Do any of these characteristics of a disorganised attachment style sound familiar? In adult relationships, a disorganised attachment style can appear as repeated attempts to heal early relationships where neglect, abuse and trauma led to feeling intensely wounded. Lots of emotions, ranging from rage to a deep sense of loss, may be felt as a yearning for unconditional love and acceptance within a safe relationship. Patterns we learned in childhood to deal with problematic caregivers may play out in future relationships in an attempt to heal the wounded child within us, and to win the love and affection that we crave. As an adult, we may know the futility of our actions, but the wounded child keeps trying, the failed attempts leaving us stuck, feeling like we’re not enough in relationships, and unlovable. As infants, we are pretty helpless. We can’t do much for ourselves, so we must rely on our caregivers to take care of us. This includes our psychological needs, as well a our physical ones. If our caregivers do a good job of looking after us, communicating their understanding of our needs by responding appropriately to our demands, we will feel safe and secure. This loving relationship between an infant and their caregivers leads to what’s called “secure attachment”, and a securely attached infant can learn how to be in relationship with themselves, with others and with the world. However, if we receive unpredictable care or no care at all, exposed to traumatic events, abused or neglected, we’re at risk of developing a “disorganised” attachment style. Infants need to be cared for, but instead of being comforted by our caregivers, we come to fear them. We are in a constant state of disruption and chaos, leaving us feeling frightened and helpless, unsafe in the world with no one to protect us. 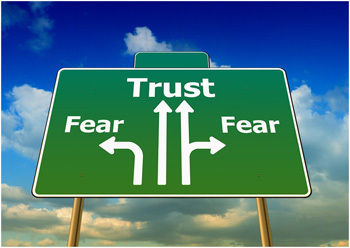 We learn that trust is dangerous because it is so often betrayed, and we may dissociate from our experience as a way to survive the scary, potentially life-threatening behaviour of our caregivers. Of course infants grow, and if there’s no change in the behaviour of our caregivers, our disorganised attachment can lead to a variety of problems. We are most at risk as a young child. Our neurological development may suffer. We may be unable to engage and bond with others. We might be too fearful to explore the world and our place in it. And the developmental and relational deficits of childhood can carry through into adulthood: the disorganised infant becomes an equally disorganised adult. Fortunately, adults have some advantages that infants and children do not. We’re considerably more self-sufficient and much less reliant on possibly unreliable adults to look after us. A relationship with just one trustworthy person can make all the difference, especially if that person is a psychodynamic psychotherapist. Through the therapeutic relationship, we can rework the early childhood experiences that formed the basis for intimacy and bonding. What may have been hidden can become more visible as we examine the role our attachment style plays in our painful relationships. The patterns from the past can be changed through understanding the basis for our repeated chaotic relationships. Developing a secure attachment with the therapist creates a place where we can experience what it’s like to be in a safe and secure relationship. We learn how to regulate our emotions in times of distress. We develop strategies to cope with feelings that may have been denied in childhood because the unstable relationship with our caregivers made such feelings unsafe. And as we start to understand ourselves better, there is the potential for us to develop compassion for ourselves and our caregivers when we begin to see the generational nature of attachment styles. The potential exists to heal rifts from the past to pave the way for generations ahead. Andrea Bentley (Pakuranga & Greenlane) has particular interest and experience in working with relational issues caused through attachment difficulties. She is part of our Citywide team of registered therapists. For more information or to arrange an appointment please contact Andrea or any of the team. Questions or comments : If you have a question about this post or on another topic relating to therapy that could be answered here, please email Andrea.